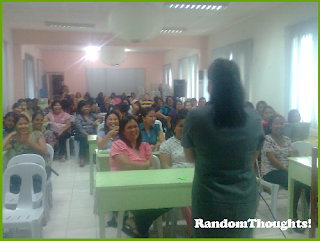 The Division of La Carlota prepares the Grade One teachers of the 24 elementary schools here for the implementation of K to 12 curriculum for this school year 2012 - 2013 in 5-day seminar-workshop at the conference hall of the said division. "We're the only chosen few. Let's do it!" Portia M. Mallorca, officer-in-charge of the Division of La Carlota challenged the 62 grade one teachers during their 5-day seminar-workshop on K to 12 curriculum implementation culmination program. "Five days of training are not enough for you. You can do more. I know you can do it. I have the confidence to all of you," strongly expressed Ma'm Mallorca. She said K to 12 is not only the work of the Department of Education (DepEd), but it is the work of all agencies. Though it is the primary work of the DepEd, but everybody must be united, must be one. "We can do it. We're doing it for the future of the children, of our city, of our country," she pointed out. Since we're the only chosen few, let's do it. Then she committed herself for the implementation of K to 12 in simple but solemn ceremony. "Everyday in every classroom, there is a teacher who will teach a child to be a full human being; that is, to develop the child with a heart," expected Mallorca from the participants. Though adamant in attending this kind of seminar, but as she involved herself in the day-to-day activities, Ms. Lanie Eseo, Grade 1 teacher of Ferlou Elementary School was convinced that this kind of work required a team work. "Working together as one team for one purpose for the improvement of the academic development of the pupil," expressed Ms. Eseo, "makes the implementation of K to 12 successful." Another Grade 1 teacher, Ms. Teresita Cervantes of Ayungon Elem. School shared her impression. She said, "K to 12 is beyond compare not only on the mental development, but for the total personality of the pupils and the teacher." She's optimistic that after 10 years of implementing K to 12, they could produce honest, morally upright, God-fearing students in the school. 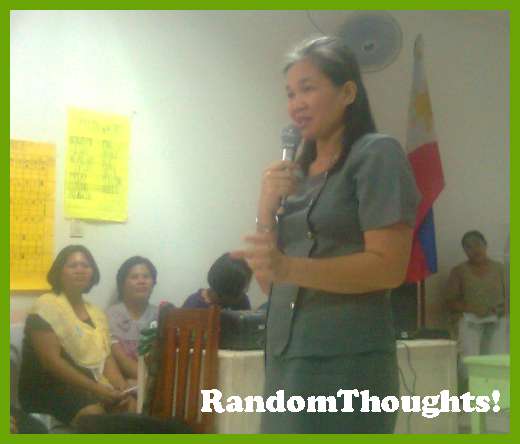 "Kanami (good) sang objectives, purpose why this K to 12 was created," she satisfying expressed. She cited a quotation that says: "A world today doesn't need a wise man, but a good man." She differentiated between a wise man and a good man. A wise man takes advantage of everything. While a good man has a positive intention, is willing to sacrifice for the good of all. "I shall never pass this way again. And if there's anything I can do, let me do it now." While singing "A Little Love", Mallorca led the teachers to incinerate their written commitment in a piece of paper in a solemn, simple rites; that's to fiery seal such commitment. The monitoring school principals of every school also participated. "We're excited!" "Good! Good! Good! Kanami gid! (It's very beneficial!)" There will be a lot of adjustments to the new curriculum. True, it is going to be a collective effort to make it successful. K to 12... A lot of hopes for the program. Keep up the good work! I come from a family of teachers , passionate professionals who believe that teaching is a noble profession. Though it will take a lot of creativity to encourage kids to stay a year more in the primary school, we just hope that it will not just be an added year of patience but of learning new things so kids could tap their hidden potentials. K to 12, way to go! Through the significant efforts of our hardworking teacher this will be a success! I like my son to be a good man as well. Thanks for sharing sir! Me too, I support that K-12 education, it's all for the future generation. i'm not in favor of K12 because i feel that PH is not yet ready for this. But i do hope and pray that this program will be good for the students. Ever since I've read about k to 12 program that's going so well with other countries, I've always thought why can;t this be done in the Phils. and now it's here it was been so swathe with controversy.... I guess the issue now here is not actually the idea of K to 12, it's about the parents having no means with or without the k to 12..
Change is usually hard in the beginning, but when we get the grip of it, we'll get used to it... we've long have done this, we've been leapfrogged by our Asian neighbors already ... but at least we've already begun.. Go Philippines, we can do this! Dropping by from BC Bloggers Comment Hop See you! additional two years! for parents, it's equivalent to 2 more years of school-related expenses: tuition fee, allowance, books, uniforms, etc. but if we try to analyze and understand its benefits to our kids, and if our government and educational system really deliver its promise, we will have a much more globally-competent kids in the future. The program looks good and I hope it can be implemented well and optimized to its full potential. We can never over emphasize the importance of good quality education. It's great that there is a lot of enthusiasm for K12. It is longer for our kids and more expense for the parents but I do believe it will benefit our children in the end. My opinion only...no matter how many years you add if the quality of teaching is poor, you'll get the same result. No offense but in all honesty, I'm not that good in english, I often run out of english terms but I can say I'm way better in grammar AND spelling than my son's english teacher. I worry I hate math so what will happen to my son now? Gil. This is a good project and it's about time. Madaming schools ngayon ang focus lang is yung academic achievement ng students. Puro about 'knowledge'. I like it when she said "not only on mental development"
Ang daming nangyari sa past decade, who wouldve thought sobrang iba na ang society. Yung mga alam natin pwedeng hindi na applicable. And the one thing that can take us through the change is the person we are. Our character, the ability to face problems, handle changes, handle stress. K-12 is actually the way to go. Its just starting out that is challenging, but with dedicated educators, this endeavor will be a success. that is what the curriculum here in the USA :-) I hope that plan will push through :-) it will help the kids to focus in school and stay away from drugs. The objective of K+12 is good. But are we ready? I ask this because I worked at DepEd before and my sisters are public teachers. I know there are still many things that needs to be done. Hopefully this program will succeed. It's good to know that teachers are open to changes not just to follow what is being instructed but also to hope that they produce a "good man". I hope everybody would give this big change a chance. I just hope that everything will turn out good with this new system. I have two kids now and I think hindi sayang ang additional expenses na mababayaran ko for another two years of schooling kasi I know my kids will learn a lot and will become more globally competent. Before I was one who disagree with this new education system but learning how it works so far enlightened me and made me realized its nice to try this new system, anyway our kids will benefit in the near future! sa tingin ko, hindilang ang teachers ang dapat maging prepared sa k-12. the parents should also be involved, kasi pag hindi nila kayang pag-aralin, di rin sila makakapasok. i think the govertment should also look for the income of the families. We're undergoing the transition period of the K+12 program. My son will skip 1 level this school year and the school provided a transition program for the summer to help the students. I am hopeful that the program will produce competitive graduates. My thoughts are with the parents who can't send their kids to school. It's good if the government are responsible enough to implement their projects to help the needy but our government isn't. I just hope everybody attains whatever goals they have with the implementation of K to 12 curriculum. Nice post about the new system of education K-12. Hope this will become successful. Very informative post.I hope this project goes well. mabuhay ang mga teachers! I know the intentions are pure, but I am not in favor of K to 12. Extending the years of education when other families can't even afford to send their kids to school. I guess it's the quality of education that we should be more concerned about and poverty. A lot of adjustments for kids and parents as well. Eventually though, it'll benefit us all. Hope the new syllabus will be good for the students. Interesting! Though I can see that PH is not yet ready for this new curriculum..I just hope and pray that it will be successful. i always see teachers as hardworking people with pride and passion. I hope that our government will support them as well as to give priority on having a good education for the children of this country. I don't know how the teachers can cope with added responsibility. But I know they will be doing their best for their students. Teaching is indeed the most noble of all professions. OMG!!! i do appreciate all the passoinate teachers but i'm really not in favor for the new curriculum. There were problems in the old one that we can't even address to properly yet and then THIS. I hope for the better. And Good Luck. I hope that this program will be good for our children. Our government must act on this matter responsibly. K12 program will help the country shape the future for the children. AS well as the teachers who are hoping to join and be accepted in the government service. I'm so happy with your blog site, it contains all the matter with regards to k12 education Good luck to you and your well performed job. Thanks for keeping us updated with the latest information for k-12 education and more.